TMI Salt Pure is proud to announce our partnership with Olivet Nazarene University and their new Student Life and Recreation Center. The Student Life and Recreation Center (SLRC) features include a 200 meter running track, a four story climbing wall, two beautiful Salt Pure® pools and a Salt Pure® spa. Designed from the start with energy saving features in mind, the SLRC has been recognized and honored by the local energy provider for its sustainability and efficiency. Designed by Buchar, Mitchell, Bajt Architects Inc in conjunction with Elara Engineering, the facility features an advanced geothermal heating and cooling system, a heat recovery ventilation in the field house, and an outdoor based dehumidification system for the aquatic center, among other cutting edge systems. The TMI Salt Pure systems mesh perfectly with these ideals by reducing the number of hazardous chemicals onsite, producing natural chlorine out of simple salt water, and reducing their reliance on trucked in chemicals. The aquatic center contains a 10 lane competition pool with a constant depth of 2 meters, a resistance pool, and a 10 seat whirlpool, all designed and engineered by Richard Scott with Aquatic Excellence. 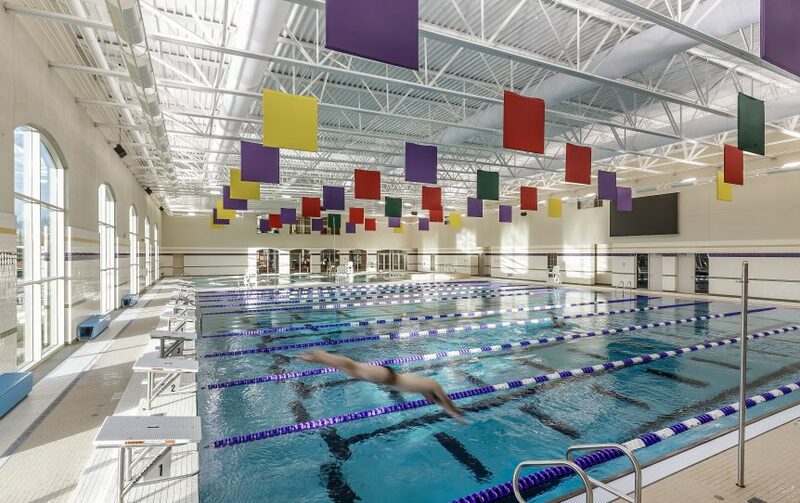 The Salt Pure® competition pool is an exciting addition to the ONU campus, since it allows the introduction of men’s and women’s intercollegiate competitive swimming. Both teams have recently completed impressive first seasons. The 168,000 sq. ft. SLRC opened at 12:12am on 12/12/2012 to a crowd of more than 1,500 students, faculty and staff. Olivet Nazarene University has stated that the Student Life and Recreation Center was designed to promote community life, student relationships, health, fitness and fun. TMI is proud that we can be a part of such a forward thinking, progressive institution. Update: As of October 10th, 2013, the Student Life and Recreation Center was officially named the “Douglas E. Perry Student Life and Recreation Center.” Read more here!